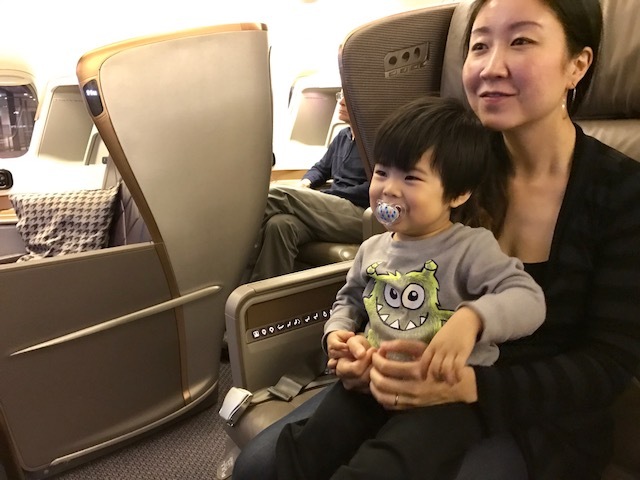 On March 30, 2017 at 7:15pm, my family boarded the Singapore Airlines Boeing 777-300ER aircraft bound for Los Angeles (LAX) from Tokyo (NRT). 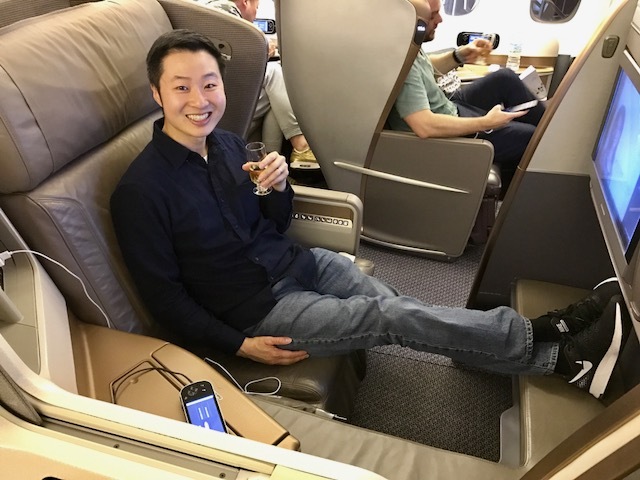 This was the second time we got to experience Singapore Airlines new Business Class. 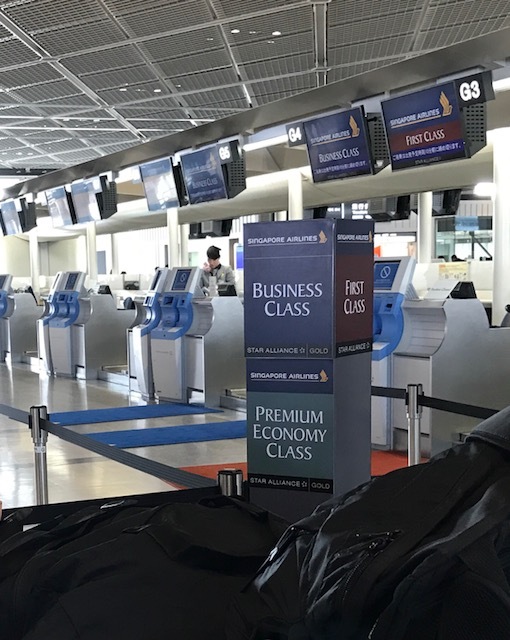 We few Singapore Airlines Business Class from Los Angeles to Tokyo on March 16, 2017 and were excited to fly Business Class once more for our flight home. We arrived at the airport early so that we could relax and hang out at the Business Class lounge. The regular line to check in for our flight was quite long. Since we had Business Class tickets, we didn’t have to wait in the regular line to check into our flight and drop off our luggage. Our Business Class tickets also allowed us to skip the normal airport security line and enter the Gold Track entrance. We definitely felt like VIP. Our next stop was the ANA Business Class Lounge, which our boarding passes gave us entry into. Inside, there are several different areas of the lounge. There is a quiet “napping” room with large recliners inside cubicles. There is another area for private shower rooms, perfect for freshening up during long layovers. The main seating area has plenty of comfortable sofas to relax in as well as desks to get work done. Free WiFi is provided for lounge guests. The buffet offered plenty of cookies, snacks, yogurt, sushi rolls, noodles, and various hot dishes. There was plenty of self-serve alcohol and beer. The sushi bar offered freshly prepared tuna, prawn, or salmon nigiri with soy sauce, wasabi, and ginger. The sushi chef only served 2 pieces at a time, so we had to make several trips to get more sushi. The sushi was very tasty and paired nicely with ice-cold Japanese beer. The noodle bar offered freshly prepared ramen, soba, udon and curry bowls. For an airport lounge, the ramen was surprisingly delicious. We definitely went back for seconds. The small soup bowls allowed us to sample the different hot noodle dishes. Everything at the noodle bar was really tasty; probably some of the best airport lounge food we’ve had a chance to try. Boarding the flight was a breeze. 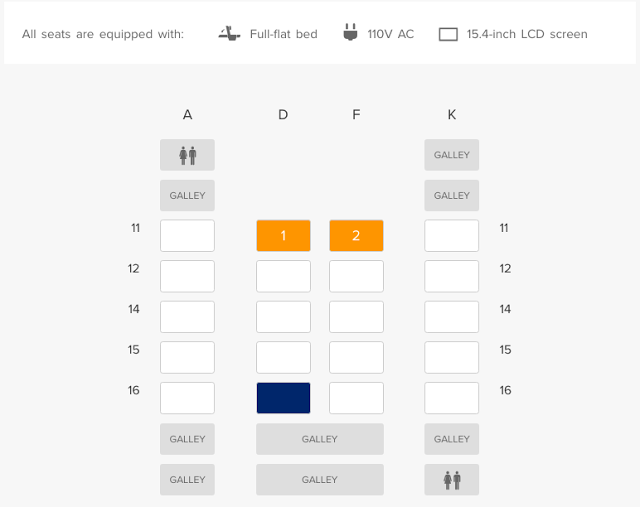 We sat in seats 11D and 11F, near the very front of the plane. As soon as we got settled into our seats, we were served champagne. 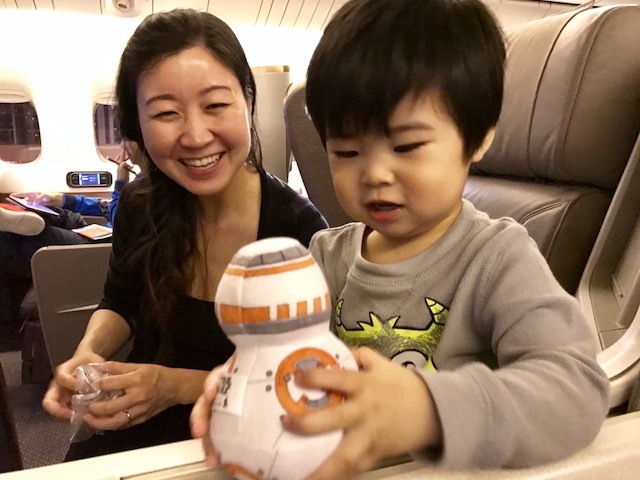 A stewardess gave our son a plush Star Wars BB-8 droid doll! He had no idea what it was, but he played with it nonetheless. It was easy to get settled into our comfortable seats. The stewardess brought us warm nuts. I started watching the rest of Jack Reacher: Never Go Back. I first started this movie while we were flying to Tokyo but didn’t get a chance to finish it. As expected, the dinner we had in Business Class was great! My appetizer was beef satay with onion, cucumber and spicy peanut sauce. My wife got the marinated prawns, smoked salmon and salad with herb dressing. We both chose the Japanese curry beef as our main entrée. We booked our meals in advance with Singapore’s Book the Cook program, which allows you to order from a special menu up to 24 hours prior to your flight in Suites, First or Business Class. The Japanese curry meat was very tender and flavorful - I wish they offered seconds. I paired my dinner with a nice shiraz red wine. We had lemon-lime sorbet with berry compote for dessert. Although we were sitting in an airplane, it felt like we were having a romantic dinner. In the bathroom, you'll find an amenities kit with toothpaste, toothbrush, comb, shaver and more. When it was time to get some rest, the stewardess came and transformed our seat into a completely flat sky bed. 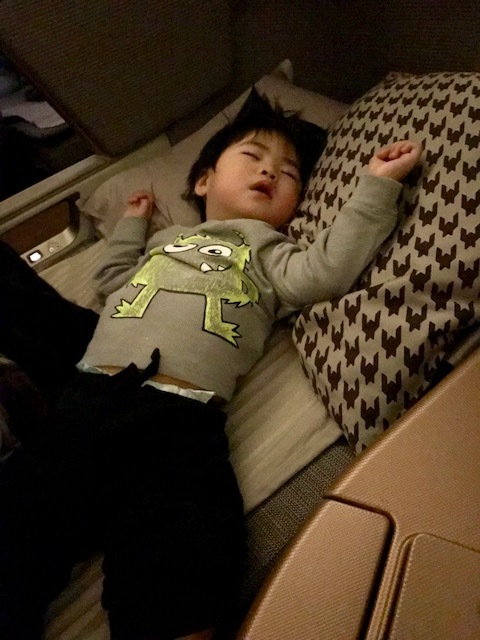 We had no difficulty falling asleep on the lie flat bed in Business Class. Our lunch started off with an assortment of breads. Then we were served parma ham with mozzarella cheese, tomato, arugula lettuce and balsamic dressing. We both had the delicious shoyu ramen that we ordered from the Book the Cook program. The noodles, meat and soup were very tasty, flavorful, and made us feel like we were back in a ramen shop in Japan. For dessert, they served us green tea cake with chestnut mousse drizzled with vanilla sauce. Mmm. 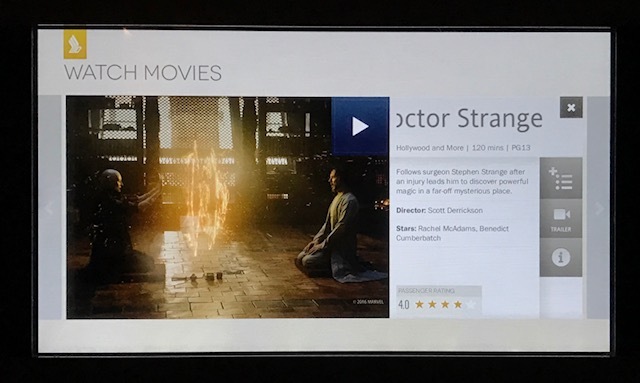 The next movie I got to watch was the Marvel movie Doctor Strange. It felt great to sit in our extremely comfortable seats, have unlimited champagne, watch in-flight movies, and reminisce about our trip. We had a great experience flying with Singapore Airlines. The service was top notch, the food was delicious, and the flight attendants went out of their way to make sure we were comfortable and happy for the entire duration of our flight. The total cost of round trip Business Class flights for both of us came out to 263,500 miles and $169.26. 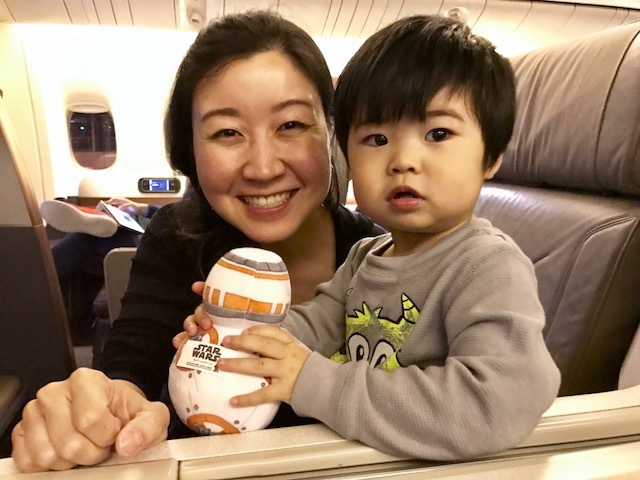 We had to pay 10% adult fare for our son's round trip ticket, which cost $432.66 (children younger than 2 years old pay 10% of full adult fare, which would have cost $4,326.60 if we didn’t book with points). After flying in Business Class, it’s going to be hard to go back to Economy. Spending airlines miles instead of cash helps us keep our money going into our investments. We are already thinking about where we want to travel next!